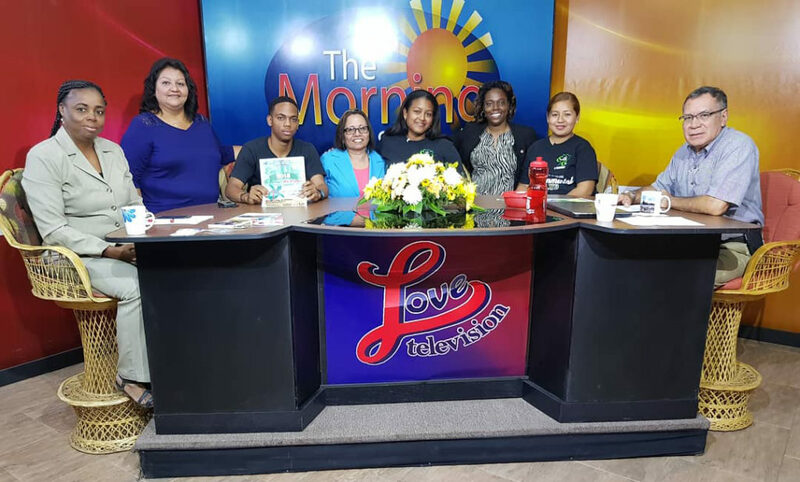 Dr. Bernard Watler, Dr. Nestor Chan, Ms. Juliane Pasos, Dr. Jean Perriott, Ms. Ava Pennill, Mrs. Camilla Barker, Justine Myvett, Jamal Witty and Eniza Orellana appeared on Love FM’s Morning Show on Monday, April 16, 2018. The Deans and Ms. Ava Pennill spoke on the new programs that their respective faculties are launching. Mrs. Barker spoke on the upcoming Open Day to be held on April 26, 2018. Dr. Perriott took the opportunity to invite students to the annual Relathon that will be held on Sunday. Justine, Jamal and Eniza spoke on Earth Day that will be held alongside Open Day and also spoke on plastic pollution and the importance of finding alternatives. Professor Emeritus Clement Sankat met with UB alumnus Jillian Morrison. Jillian graduated from the University of Belize with a Bachelor in Mathematics. Jillian Morrison is currently a 4th year PhD Statistics Student at Washington State University (WSU) where she is also pursuing a Master’s Degree in Computational Finance. Professor Sankat congratulated Ms. Morrison on her achievements to date and said that she is a wonderful ambassador for the University. He also urged her to complete her studies and return to the UB. Mr. Douglas Morrison, Jillian’s father and also lecturer in the Faculty of Education and Arts, was also present at the meeting. The Math, Physics and Information Technology Department (MPIT) held its Third Annual Math Symposium under the theme “Mathematics – The Key to Infinite Possibilities”. Professor Emeritus Clement Sankat delivered the opening remarks where he commended the organizers, the Faculty, the Math Club, and the MPIT department. He also spoke on the importance of having a good foundation in Mathematics. The presenters were Ms. Jillian Morrison, Ms. Annia Mejia, Ms. Vanessa Diaz, Dr. Aaron Lewis and Dr. David Aguilar. 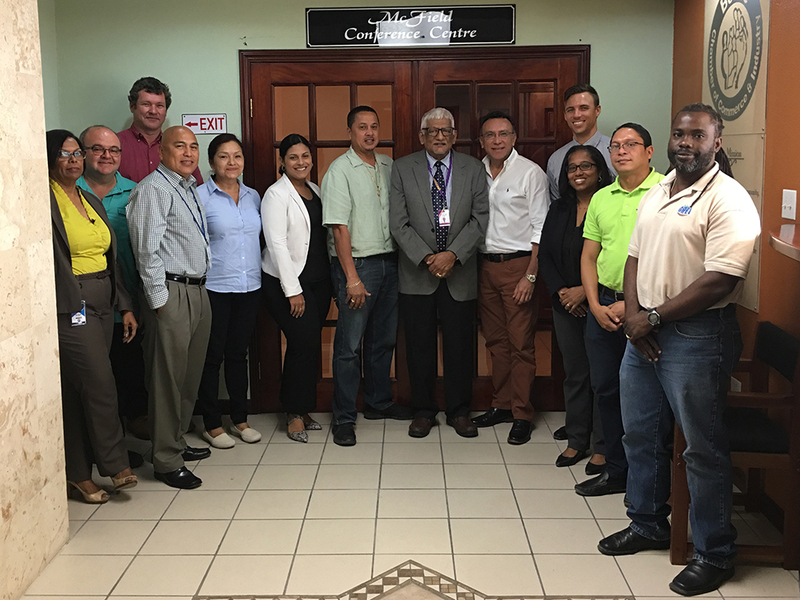 President Sankat met with the Belize Chamber of Commerce and Industry (BCCI) on April 19, 2018 presented UB’s Transformational Plan Vision 2022 to them. Present were the President of BCCI Mr. Nikita Usher, CEO Ms. Kim Aikman and members of the Board. 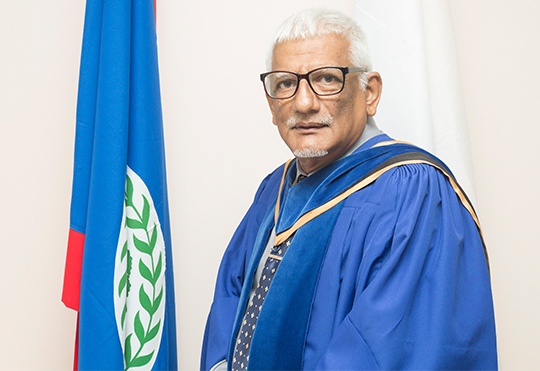 President Sankat appealed to the business community to support the University of Belize through scholarships and bursaries to students and other private/University partnerships for example, residences and buildings on campus. Members commended the University on its direction and urged that our graduates become more entrepreneurial. 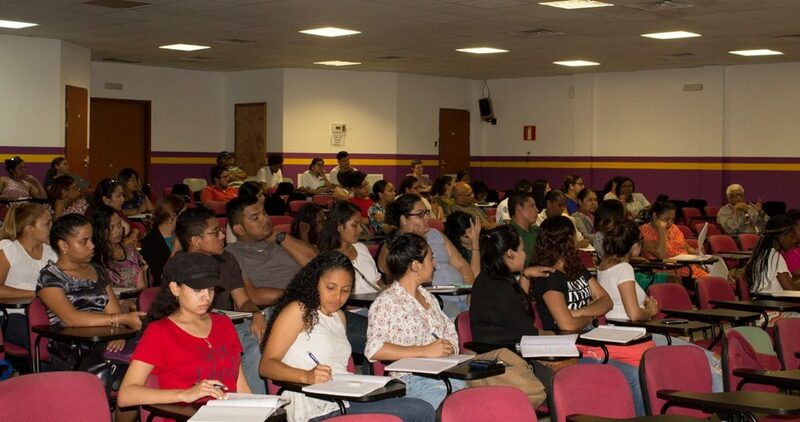 The FMSS held its Annual Research Conference in Belmopan on April 19, 2018. Dean of the Faculty, Dr. Bernard Watler, welcomed the audience and reminded them that, “knowledge only becomes valuable when it is disseminated and applied to benefit humankind”. The keynote address was delivered by Dr. Phillip Castillo, Assistant Professor and 2017 Researcher of the Year. Dr. Castillo challenged the students to, “to undertake localized research that can benefit your immediate community.” The President’s Award for Researcher of the Year was awarded to Dr. Romaldo Lewis, lecturer in FMSS. Professor Sankat presented the award to Dr. Lewis and congratulated him for his research as he congratulated the students also. 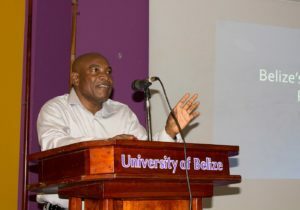 Dr. Lewis also presented his research entitled “Statistical Clustering of the Micro, Small, Medium and Large Enterprise in Belize and Constraints on their creation, promotion and growth”. The President also congratulated the Dean and Faculty of FMSS for the good work being done in terms of fostering a culture of applied research in the Faculty and especially through the Senior Students. He advised students that the opportunity for more advanced research at UB will be announced soon, for those outstanding students who wish to pursue MPhil Research Degrees. The Faculty of Education and Arts through the Educational Leadership and Administration class held a leadership panel under the theme: “Empowering Others, Building the Future Pathway to Success.” The panelists were Mrs. Joan Sanchez, Principal of St. Michael’s R.C. 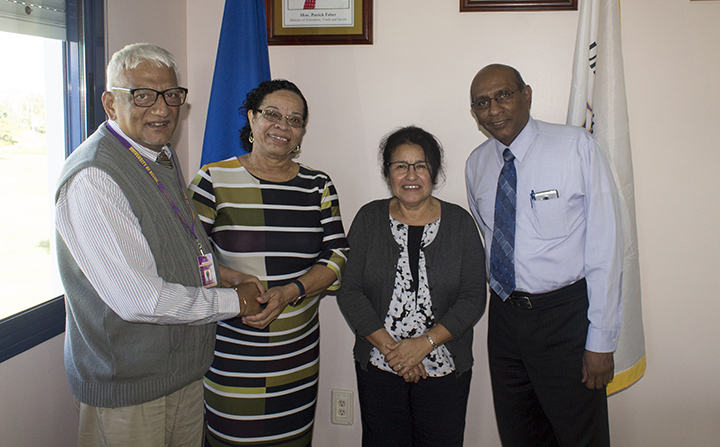 School in Las Fores Belmopan; Mr. Louis M. Wade Jr., Managing Director of Shamax Productions LTD; Dr. Judith Florita Diego, District Education Manager for the Cayo District; and Pastor Jerry Stephen Roberts, ordained minister and principal of Belmopan Baptist High School. The panel discussion is an outreach activity where leaders from the various levels of the education system as well as leaders from the business community are invited to share their philosophies along with some of their successes and challenges they face as leaders. The event was organized by the students of the course guided by lecturer Mr. Douglas Morrison. 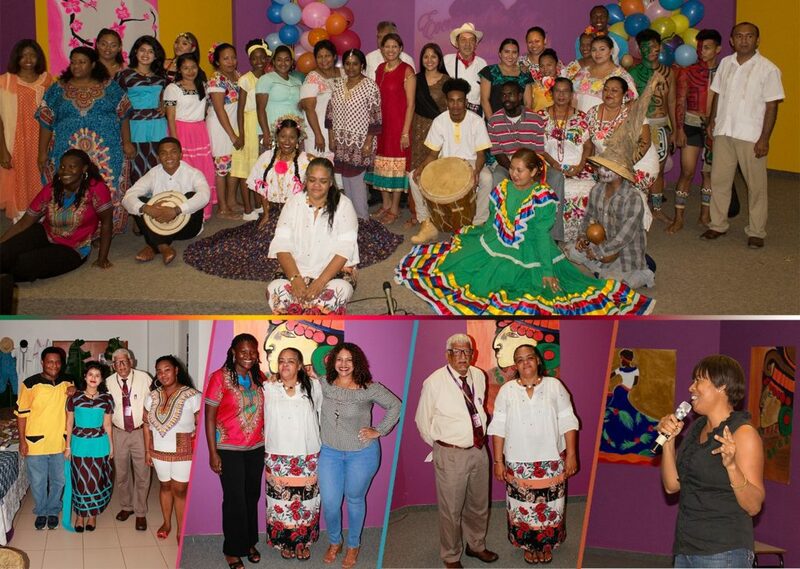 The Belize-Guatemala Relations class hosted Ambassador of Belize to Guatemala, H.E. 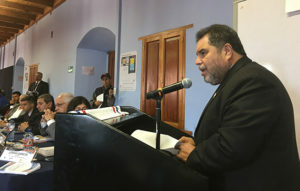 Alexis Rosado, on April 19, 2018. Ambassador Rosado gave a brief history of the territorial claim Guatemala has on Belize. He then went on to the details of “Negotiating the Special Agreement and the Referendum.” Dr. Mariot Simon, Vice President, was also present at the presentation. 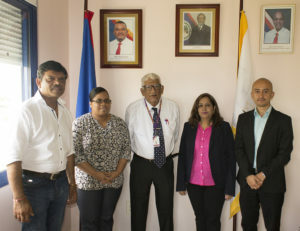 Professor Sankat along with Open and Distance Learning Department Dr. Frieda Palma met with Dr. Kiran Vanjani and Kamal Vanjani of SAI Info-Tech and Mr. Luis Alvarez from ETC Iberoamerica. The intention is to develop professional certificate courses in the ICT and that can enhance the competitiveness of our students in the world of work. Professor Sankat warmly received his former colleague Professor Carlisle Pemberton, an Agriculture Economist by training, and former Chair of the Department of Agricultural Economics and Dean of the Faculty. 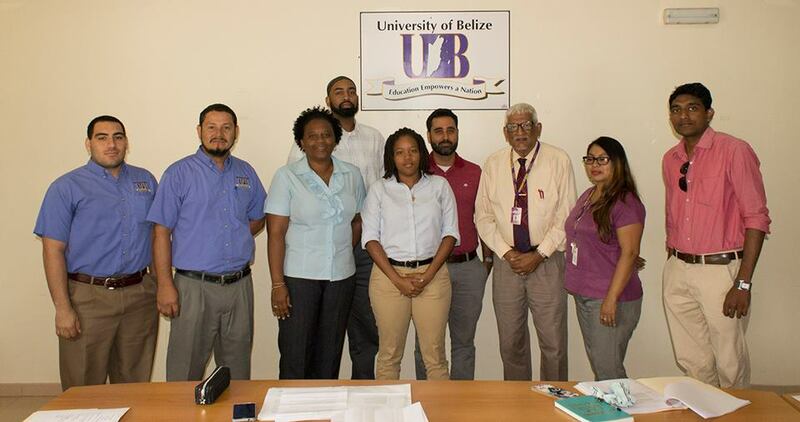 Professor Pemberton is engaged in a consultancy in Belize, on behalf of the Food and Agriculture Organization, and looking at the linkages between School Feeding Programme here in Belize and the local Food and Agriculture Sector. 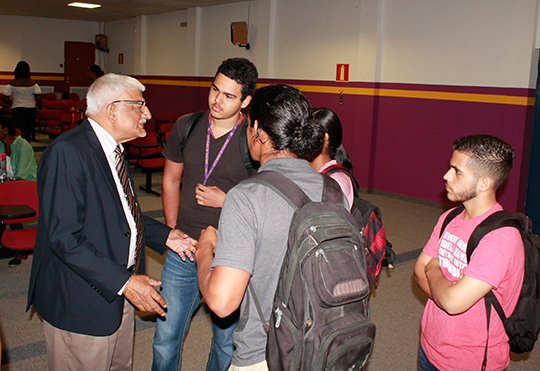 Professor Sankat visited the UB Central Farm Campus and met with students and some faculty and staff on April 18. The students showed the President the state of the dorm buildings and non-functional student cafeteria. The President was saddened as he was concerned about the state of these facilities. On a brighter note however, he saw the ongoing work being done to repair and refurbish the Micro-propagation Lab that was essential to support the EU funded project for the Banana Belt. Ambassador of Guatemala in Belize, H.E. 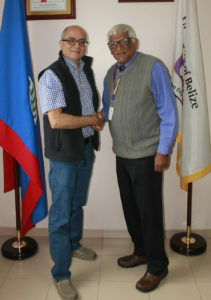 Georges de La Roche, paid a courtesy visit to the University of Belize and discussed with the President, matters of mutual interest. Professor Emeritus Clement Sankat took the opportunity today to meet two Public Safety Officers, Mr. Josiah Santos and Mr. Benedicto Cho, and their new “Scooter Patrol”. The University of Belize recently acquired two Honda Wave 110 Scooters that will be utilized to patrol the Belmopan Campus. Professor Sankat’s hope is that this mobility will facilitate a safer and more secure environment for students, faculty and staff. 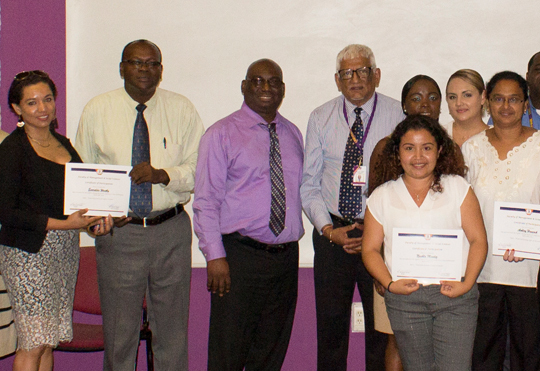 ​ Dr. Philip Castillo, Assistant Professor in the Faculty of Management and Social Sciences, presented a comprehensive overview of the Government of Belize’s 18/19 budget to faculty, staff and students. Dr. Castillo provided a summary of the projected Expenditures and Revenues. He also provided recommendations that can be pursued to balance the budget. He fielded many questions especially from the students for example, on funding the deficit in the budget and the pension liability. Professor Emeritus Clement Sankat was also present and encouraged students to be innovative and entrepreneurial when they graduate so as to generate new wealth for themselves and the country. The Campus thanks Dr. Castillo for his presentation and analysis. The Chairman of the Board of Trustees Mr. Harrison Pilgrim visited the Punta Gorda Campus on April 5, 2018. 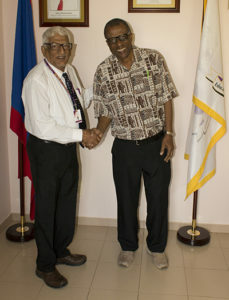 He was received by the Campus Administrator Mr. Roy Polonio and they discussed key issues affecting the PG Campus. 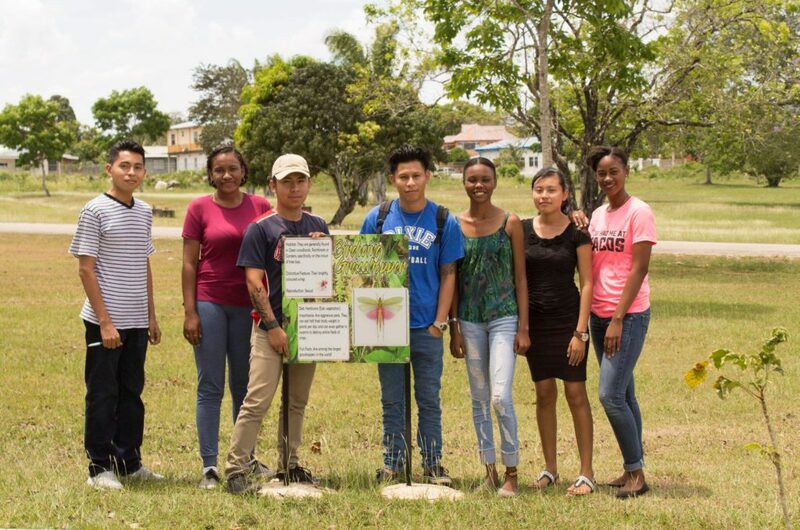 The UB community in the Belmopan Campus can now learn more about animals on campus after eight colourful information signage on invertebrates of the campus were placed along the walkway leading from Library towards RLC and Administration building. 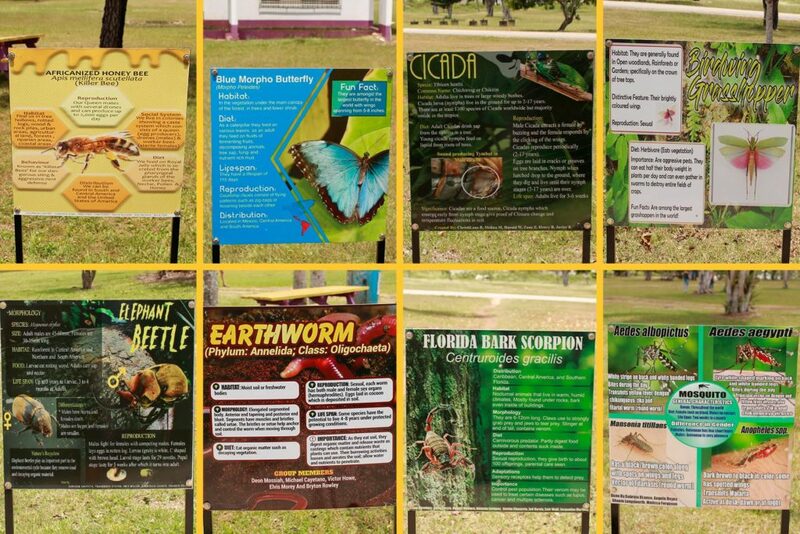 The signs provide information on Africanized Honey Bee, Blue Morpho Butterfly, Birding Grasshopper, Cicada, Florida Bark Scorpion, Elephant Beetle, Earthworm and Mosquitos. These are as a result of class projects done by Bachelor Biology students for the course, Natural History of Invertebrates taught by Dr. Latha Thomas. This is part of the University beautification initiative aimed at educating the community on the animal biodiversity of the campus and their importance. Professor Emeritus Clement Sankat commends Dr. Thomas and her students for this educational and creative initiative. The Office of the President provides updates on What’s happening at UB under the lead of Professor Emeritus Clement Sankat. Let me thank the head of the Open Campus for giving the University of Belize and myself an opportunity to bring greetings on this very special occasion of the 70th Anniversary. At the onset therefore “best wishes to the Regional University of the West Indies on this 70th Anniversary and may the next 70 years bring it even greater success in advancing Caribbean Development and cohesiveness in “Regional Higher Education, Research, Development and Innovation”. 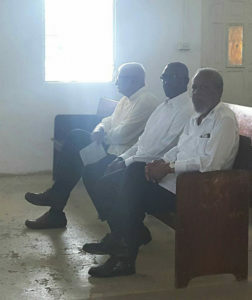 Governor General of Belize Sir Colville Young, Chairman of UB Board of Trustees Mr. Harrison Pilgrim and Professor Emeritus Clement Sankat attended a Thanksgiving Service, on Sunday January 28, 2018, at the Lake Independence Baptist Church, Belize City in commemoration of University of the West Indies’ 70th anniversary. 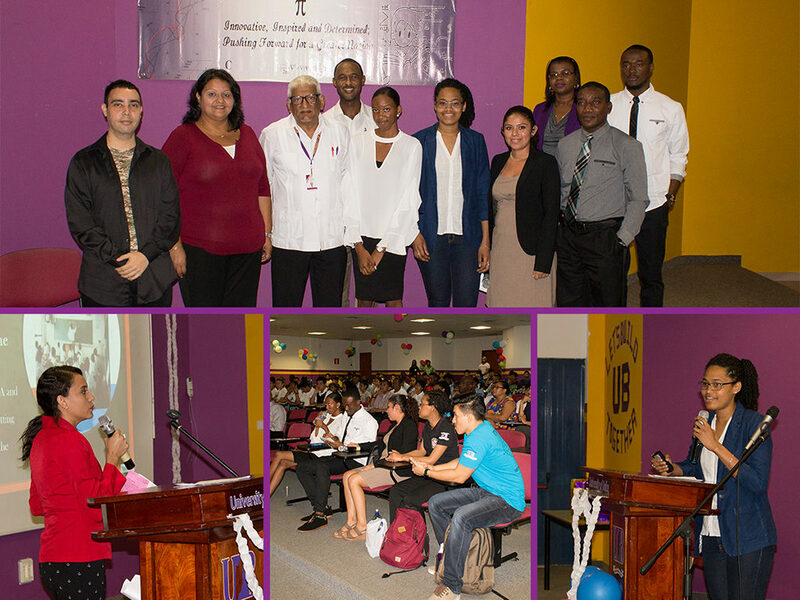 This event was hosted by the UWI Open Campus, Belize City. 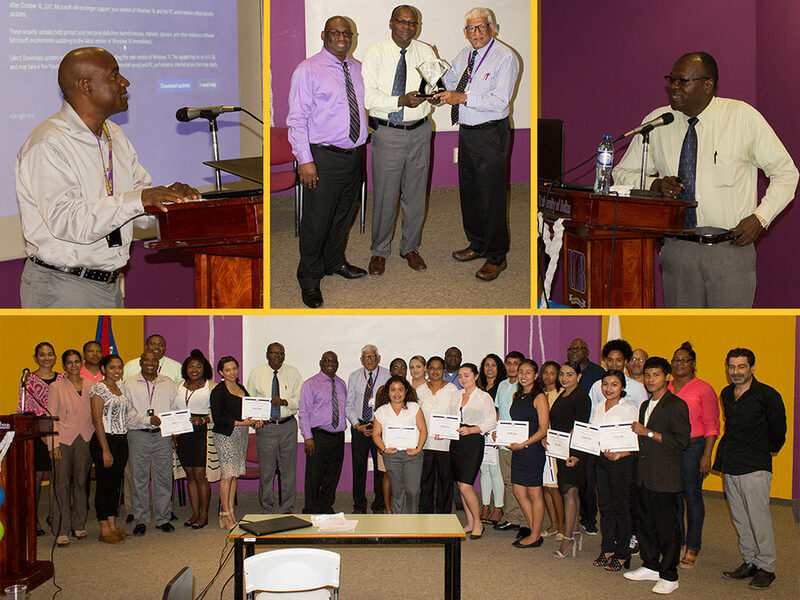 Professor Emeritus Clement Sankat congratulated the University of West Indies, “A light rising from the West”, for their contribution to the high level human resource development of the Caribbean region during these seventy years and wished this Institution the best for its next 70-year journey. Professor Sankat; Mr. Deryck Satchwell, member of UB Board of Trustees; and Vice President Dr. Mariot Simon met with Dr. Carly Womack-Wynne from University of North Georgia (UNG) on February 2, 2018. 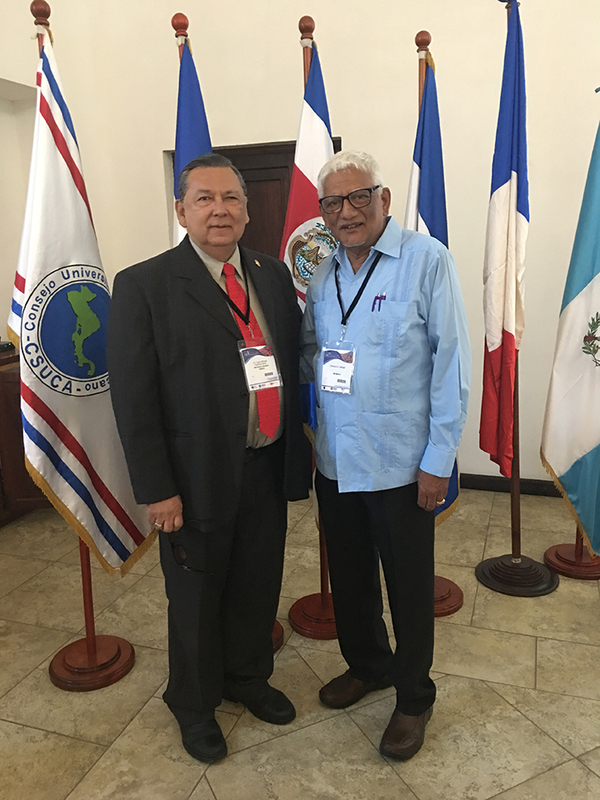 UB and UNG are both COBEC (Consortium for Belize Educational Cooperation) members. 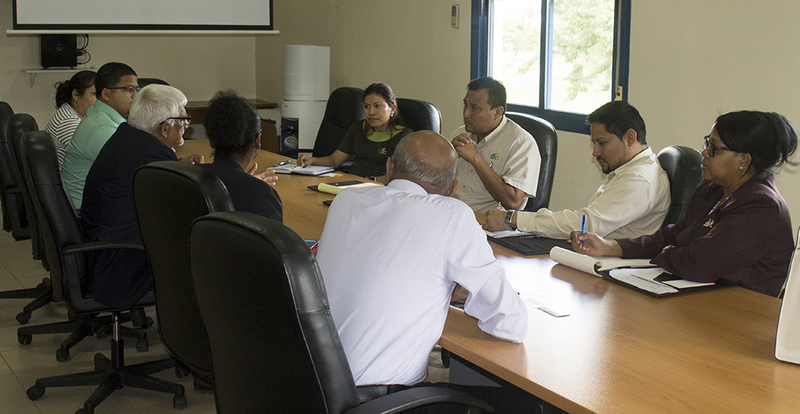 The meeting was to discuss matters on building quality in higher education at UB and in Belize. There is much hope for a fruitful collaboration between these two COBEC Universities. 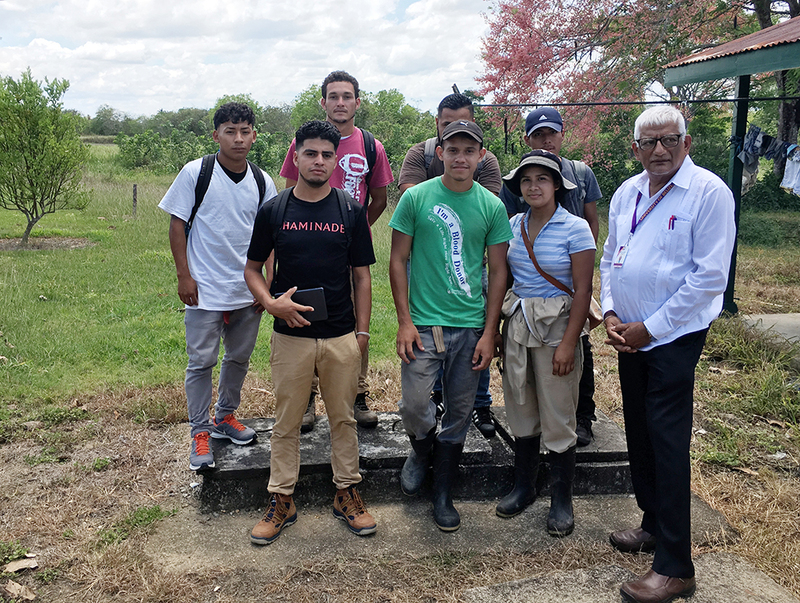 On Saturday, February 3, 2018, Professor Emeritus President Sankat joined members of the Physical Plant Department to install Solar LED light fixtures on the Belmopan Campus. 16 fixtures were installed along the walkway between the Administration Building Junction and the UB Book Store. 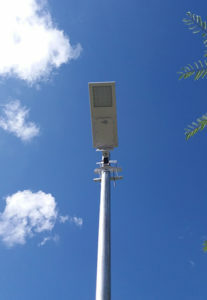 These light fixtures are energy efficient with a feature that utilizes 25% of its energy which increases to 100% when there is movement in close proximity to the poles, giving higher lighting intensity. 36 more lights are scheduled to be installed within the next few weeks, as we step up the lighting on the campus to enhance faculty, staff and student security. More information on the LED lights can be found here. President Sankat met with Dr. Emilia Hodge, Co-Chair of COBEC, and staff member of the University of Florida, on February 5, 2018. UB had a booth at the Tertiary Options and Opportunities (TOO) fair held at the Saint Catherine Academy Multi-Purpose Auditorium in Belize City on January 31 and President Sankat attended the opening of COBEC Winter Conference held at the Best Western Belize Biltmore Plaza. President Sankat congratulated COBEC on its 30th Anniversary. He also took the opportunity to congratulate Assistant Provost Dr. Cynthia Thompson, who received a recognition award from COBEC as a founding officer of COBEC. The President assured Dr. Hodge of UB’s desire to engage with COBEC Member Institutions to create winning partnerships that support our development. 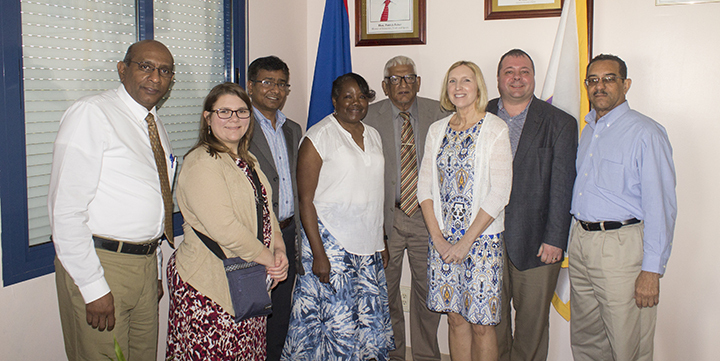 On February 6, 2018 Professor Emeritus Clement Sankat accompanied by Vice President Dr. Mariot Simon, and Mr. Ewart Robateau met with a delegation from the College of Health Professions, Grand Valley State University, United States. The delegation comprised of Julie Hall, Assistant Dean; Dr. Azizur Molla, Associate Professor in the Department of Public Health; Chad Sutliffe, Allied Health Sciences Department Chair; Dr. Gianne Smith – Director of Social Work; and Rebecca Hambleton, Director of Study Abroad and International Partnerships. 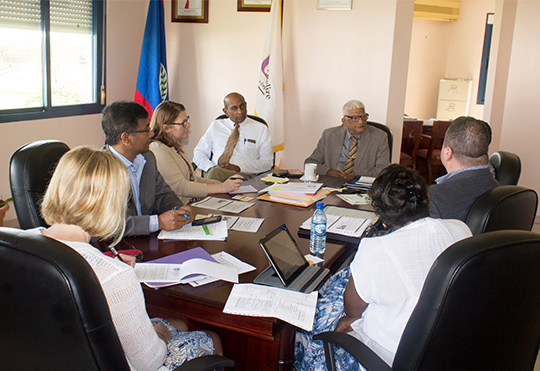 The meeting focused on partnering in Health Education, Sciences and Social Work. The visiting team met with leaders from our various faculties. The President is pleased to advise that the Polycom equipment is now fully installed at the Faculty of Management and Social Sciences (FMSS), Belize City Campus in the Doctoral Room. 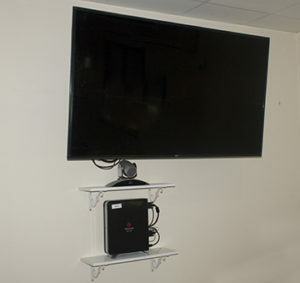 This equipment will facilitate live Video Conferencing between Belize City, Belmopan, and in fact the world. It has built in features to enhance video and audio quality thereby providing a better conferencing experience. Use of the equipment is under the control of Dr. Bernard Watler – Dean of FMSS and ICT in Belize City. 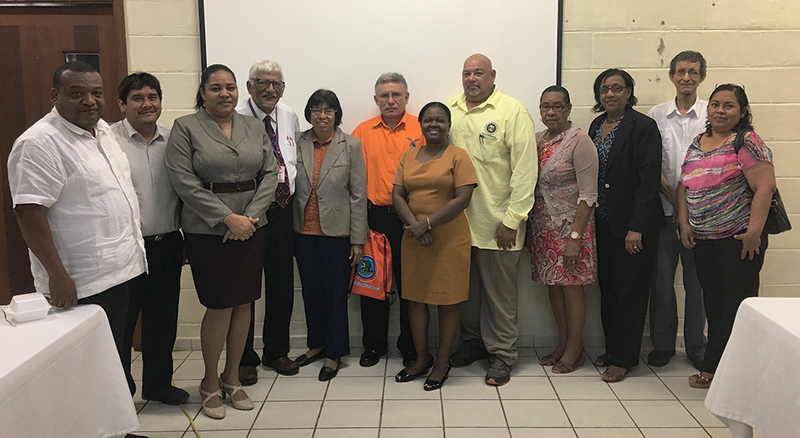 Professor Emeritus Clement Sankat –President, Dr. Mariot Simon – Vice President, Dr. Jean Perriott – Dean of Student Affairs, Mrs. Rose Pineda – Registrar met with the executive members of the UB Student Governments. President Sankat welcomed the student leaders and offered all of them best wishes and continued success. Discussions were focused on student concerns, notably students’ inability to pay their tuition and fees at the required deadline, which has now been extended to March 30, 2018. Professor Sankat asked the SG leaders to encourage students to meet their obligations and to consider student loans from DFC as an option. 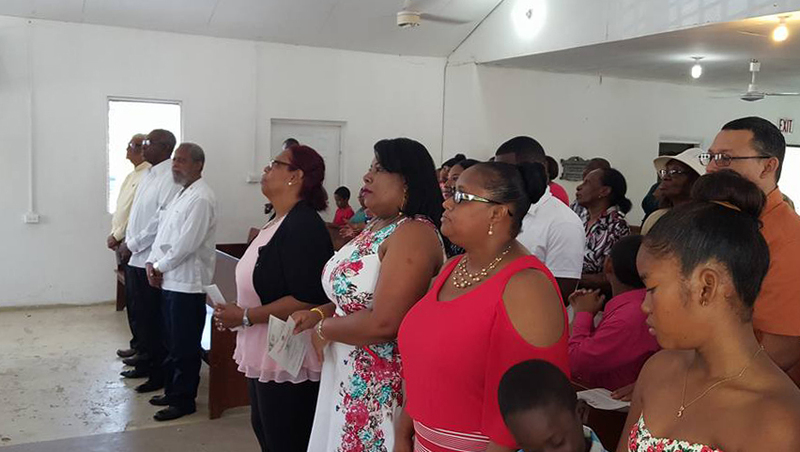 The next update was on Graduation Exercises that had been agreed to by SG for a Graduation Ceremony in PG on June 14 and one ceremony in Belize City on June 16 for Belmopan, Belize City and Central Farm campuses. Students who have met graduation requirements are now able to apply for their official UB certificate prior to the Graduation Exercise. President asked the SG to urge students to participate in the Graduation exercise even after receiving their certificates. SG members expressed ongoing concerns in their specific area including infrastructure, inadequate lighting, parking lots and cafeteria upgrades. President reassured SG members that all of these are on his priority list, however they are welcome to work along with the Director of Physical Plant, Mr. Francis Burns, for assistance including other projects that SG would like to execute. These include a Palapa in Belmopan and a cafeteria in PG. President Sankat thanked all the student leaders for taking time out to attend the very productive and informative meeting. He reminded them that UB is a Student Centered University and he will continue to work with them to improve student experience at The National University. 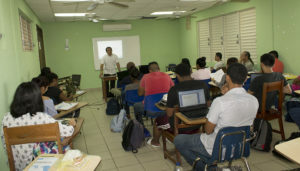 In an effort to provide relevant, affordable and accessible education to UB students and to ensure that students are able to meet their financial requirements, Professor Sankat, Dr. Simon and Mrs. Sherlene Julien – Director of Finance, have been meeting with financial institutions to encourage them to develop dedicated student loan facilities. One immediate option is the Development Finance Corporation (DFC) that has attractive student loan facilities. All students who would like to explore this option are invited to a presentation by DFC representatives at the Jaguar Auditorium on February 7 from 2:00pm -3:00pm. President Sankat met with the Chairs of the NCE & NCTVET, key stakeholders of education and senior leadership of the Ministry of Education. President Sankat shared with these boards the Transformation Plan of UB. He fielded questions on how these plans will shape and improve the services and programs offered by UB. 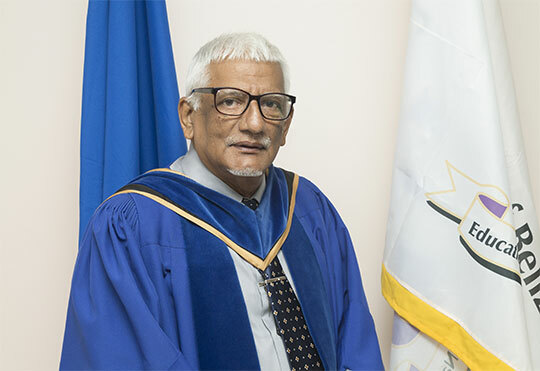 President Sankat emphasized the current challenges at UB especially that of finance and he asked the Joint Boards for their support of the University of Belize. This meeting demonstrated considerable goodwill for UB particularly in light of the thrust to move more to Bachelors and Graduate Degrees. Professor Sankat, Dr. Mariot Simon and Mrs. Hertha Gentle – Director of Human Resources met with the Faculty Focus Group in a follow up meeting to update and provide feedback on major HR topics including that of contracts for faculty. The President indicated that this was a pressing matter the he wants completed as soon as possible. The meeting was very constructive and a way forward with respect to Faculty Contracts for all is being finalized by HR for further review. 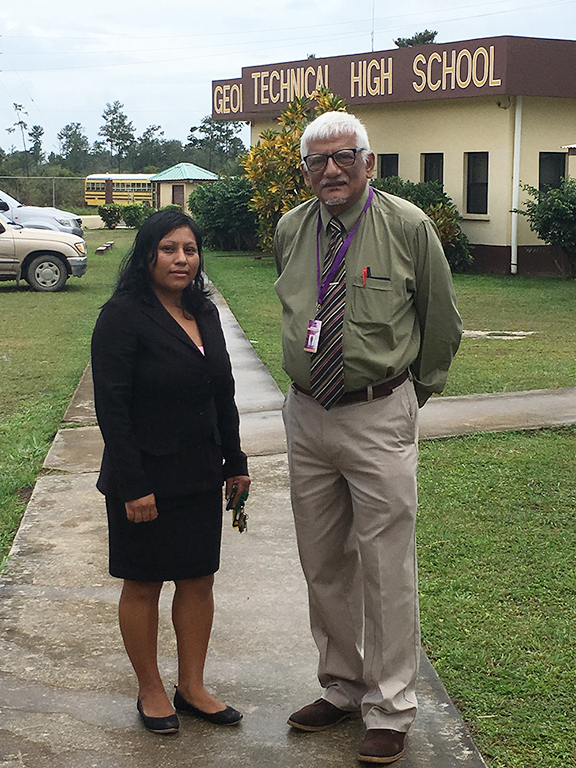 Professor Sankat and Mr. Francis Burns visited the Georgetown Technical High School located in southern Belize to exam the facilities there. 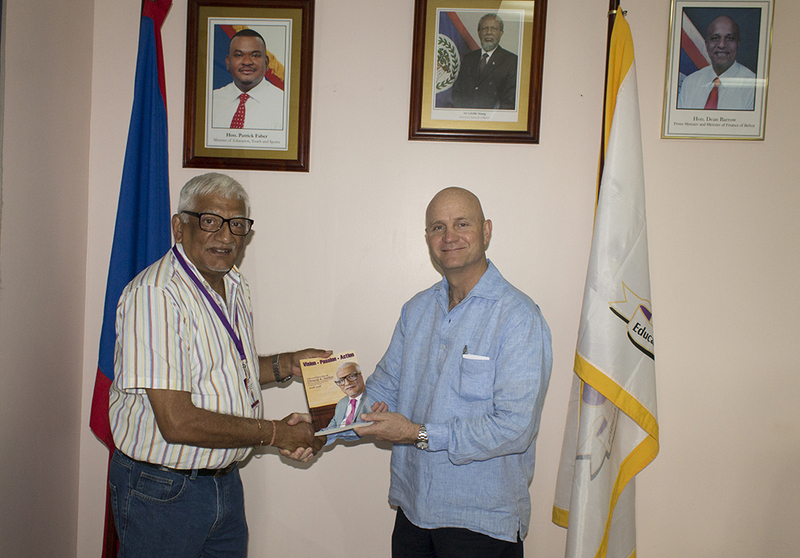 The main focus was to get a closer look at the Workshops that were funded by the European Union Project: This is to be used as a guide for the India-Belize Centre of Engineering (IBCE) project. 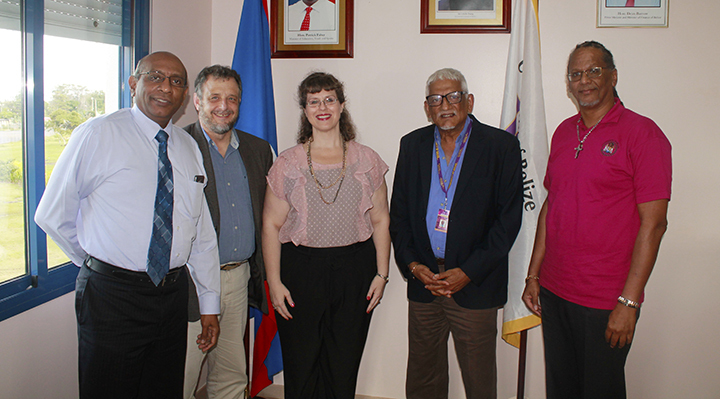 A MOU was signed in December 2017 by the Government of Belize and the Government of India to execute a project which seeks to upgrade and modernize the existing workshops at the Department of Engineering in the Faculty of Science and Technology of the University of Belize. 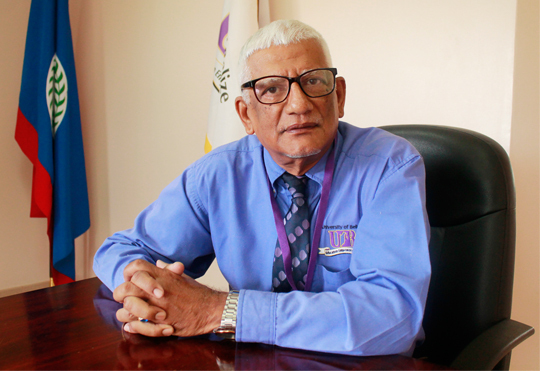 A new workshop will be constructed on the Belmopan Campus through this project. 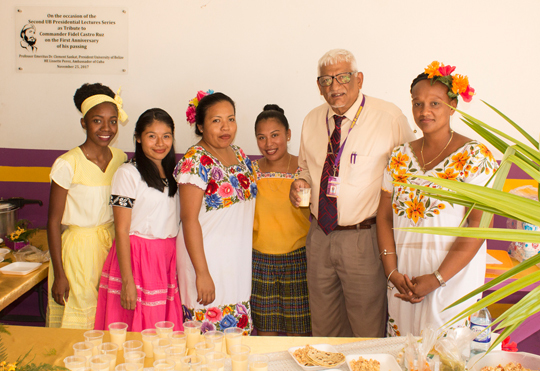 The University of Belize has participated in The La Ruta Maya River Challenge for many years. This year the Black Jaguar Intramural team have been practicing since October 2017. 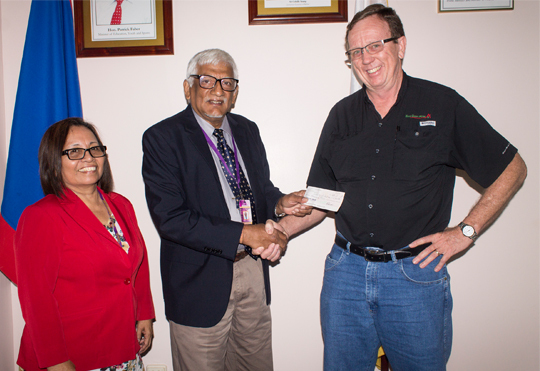 President Sankat was grateful to receive a check of $3,000 from Mr. Peter Koop from Koop Sheet Metal to assist with defraying expenses. The President expressed his appreciation to Mr. Koop and asked that he meet with the Spanish Lookout Business Community to build a partnership with UB. 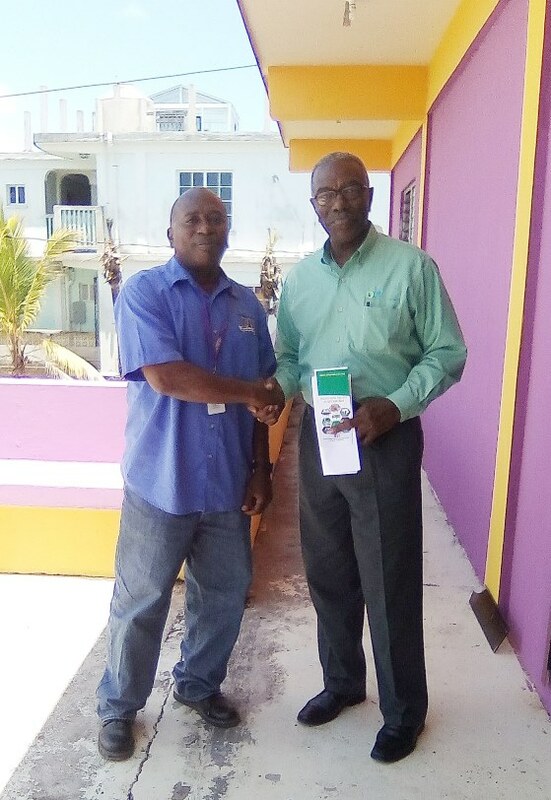 President Sankat met with the Chair and CEO of the Caribbean Food Crops Society, Dr. Wilfredo Colón to discuss the hosting by Belize of the upcoming annual meeting of CFCS scheduled for July 8 – 13th, 2018. This would be very beneficial to UB and to the entire country of Belize as Agricultural Research, innovation and best practices will be showcased. Members of Faculty of UB will be encouraged to present papers at this conference. The meeting will include stakeholders from the food, agricultural and business communities from Belize, the wider Caribbean Region and Central America. An update will be provided on this in the upcoming weeks. Welcome back to the National University of Belize as we commence the second semester of the academic year 2017/2018. At the same time let me wish each and everyone, and your families, my best wishes for the New Year 2018. I sincerely hope you had an enjoyable and restful holiday season with your loved ones. The New Year offers a great opportunity for personal and academic growth. Every year brings new challenges for all of us and our Institutions, some old and some new ones. Let me say that 2018 is a year of renewed hope for our University, an opportunity for us to continue to reach for a higher level in the service to our stakeholders, especially you, our students of the University of Belize. Our Transformational Plan for the period 2017-2022 is what gives us hope for a much better Institution. During your break the Fultec Systems Computer Lab, which was upgraded last semester and includes 70 new computers was inaugurated at the Belmopan Central Campus. This is a prime example of the advancement we are working towards at UB. This year our immediate focus will be on execution and reaching our higher goals. It gives me great pleasure that orientation for new students entering UB for January intake had over 100 participants from all over the country. Thanks for taking the time to be in attendance and for choosing UB to fulfill your educational needs. We at UB give you a special welcome and would like to assist you on your educational journey. As UB students, you are the reason we have a University and you remain at the center of all that we do. If during your time with us, you have any questions, concerns, comments or suggestions, please send an email to concerns@ub.edu.bz. This email is checked throughout the day so don’t hesitate to contact us.